Check Out Our Music Here! 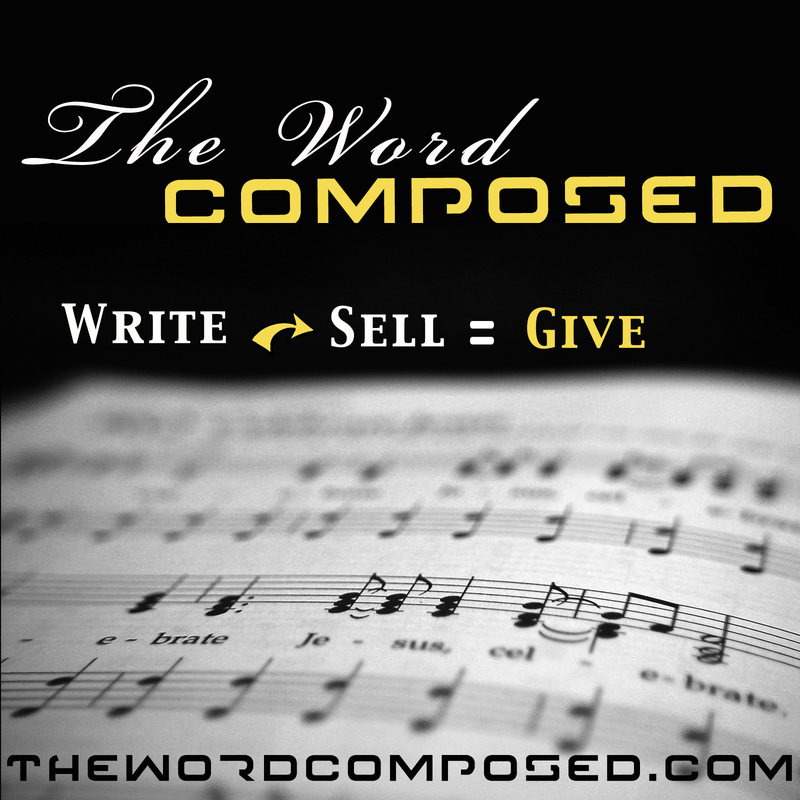 What is “The Word Composed”? We’re back with renewed vision and purpose. 2014 is soon coming to an end and I can see how the vision of this ministry has slowly died. The Lord really has a way of making his perfect will play out. We have a renewed vision, our hope and desire is to bless the world with the gospel. This begins with creating a musical project that we can sell. As the music sells we will build funds to give to ministry. We do not have any particular ministries in mind but we believe that through prayer the Holy Spirit will guide us (John 16:13). Please keep us in prayer and stay tuned to see The Lord work in beautiful ways as we seek and save the lost for his eternal glory. The Word Composed ministry team. 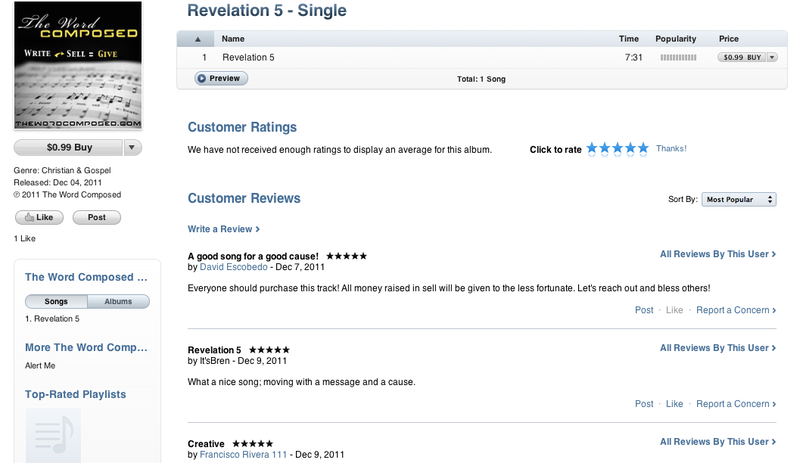 Our debut single Revelation 5 is getting some iTunes attention! It has not even been a week and our debut single “Revelation 5” is getting some real attention. We are moving up in popularity and are receiving song reviews! Please consider purchasing this track because all proceeds will go toward blessing others!!! Also please consider rating the song and writing a review to help out our iTunes ratings! You can use the player below to preview Revelation 5! The single “Revelation 5” now released on iTunes music! The 7 minute and 31 second track composes the whole 5th chapter of Revelation 5 into song form. 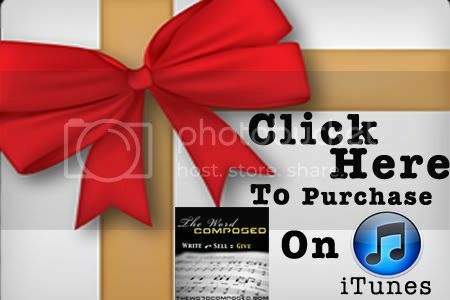 All proceeds from each song sold will go toward blessing others! After iTunes takes their fee I get .70 cents to give to others. So please spread the word by liking this post. Click the link below to purchase Revelation 5 on iTunes. Help us spread the word and bless others! Please take a second and clear you mind. Imagine a life of poverty and hopelessness. You live in a grass hut with a dirt floor, eat maybe a bowl of rice every day and drink dirty water. You are infected with HIV/AIDS and can feel your body slowly dying. Though you are 8 years old you work as a servant, an unpaid servant. You have no hope in life but you keep going. Without medical care you will die very soon. You will die hopeless and alone.. So the question is what are we doing? Do we even care about the needs of others outside of our families? Has the Lord’s calling and purpose for your life been choked out by our desires and needs? By the glamorous lights of Hollywood flashing from our television sets? It kills me that I watch my favorite TV show or snack on some chips while another child dies in some unthought-of country. What if that was our child? How would we feel? These are the questions that I have been challenged with recently. I had to take a step back and put myself in the scenario for the impact to really take place. So if Jesus lived the life of a homeless man, why do we hold on to our possessions so tightly? It takes 2 dollars a day to feed a starving child. What habit could we cut out in our lives in order to bless another person’s needs? This very need has birthed the Word Composed and FEED ministries. Not only will our ministry record a praise and worship album with 100% proceeds going to the needs of others, we will also give daily sacrifices to provide for these needs also. More info to come on how we can make a difference. Receive an email when a new song is posted! Email me your new songs! Click any word to see affiliated posts.